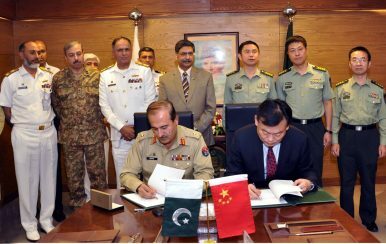 In its quest for a wartime-capable surface fleet, the Pakistan Navy has signed an agreement for two more Type 054A Jiangkai II-class guided missile frigates with Chinese shipbuilder China Shipbuilding Trading Co Ltd. (CSTC), the service announced on social media on June 1. The Pakistan Navy has previously signed a contract for two Type 054A warships in 2017. While neither CSTC nor the Navy disclosed the per-unit price of the warship, according to a cost estimate published in The Diplomat, the price of a Type 054A guided-missile frigate is estimated at around $348 million. The stealth frigate is armed with HQ-16 medium range air defense missiles and boosts a 32-cell vertical launching system (VLS) in the forward section, capable of firing anti-ship and air defense missiles as well as anti-submarine torpedoes. It also features a Russian-made AK-630 fully automatic naval close in weapon system and a Chinese variant of the AK-176 76-millimeter naval gun. (…) In addition, the ship is equipped with a Type 382 phased-array radar system and Type 344 and Type 345 multifunctional fire control radar systems, capable of over the horizon targeting. As of May 2018, the People’s Liberation Army Navy has inducted a total of 29 Type 054A frigates. China dispatched three warships including a Type 054A frigate for a goodwill and training visit to Pakistan last June. Type 054A guided-missile frigates are seen as an intermediary design with CSTC already working on an improved 5,000-ton variant, the Type 054B or Jiangkai III-class guided-missile frigate, expected to be commissioned in 2018.